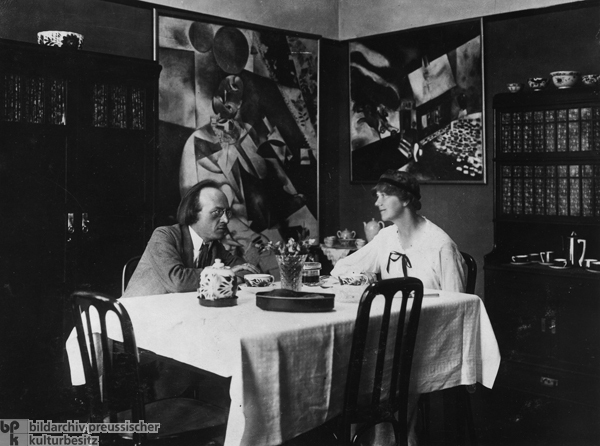 This photograph shows the arts impresario, publisher, and gallery owner Herwarth Walden (1878-1941) and his second wife, Nell Roslund (1887-1975) in the dining room of their apartment on Potsdamerstrasse. Two paintings by Marc Chagall (1887-1985) hang on the wall. Walden was born Georg Levin in Berlin. His first wife, the Expressionist poet Else Lasker-Schüler (1869-1945), to whom he was married from 1901 to 1911, suggested that he change his family name to Walden in reference to Henry David Thoreau’s literary masterpiece. Walden’s enthusiasms evolved over time and included music (as reflected by his brief attempts at composition), literature, painting, and finally left-wing politics. In 1904, he founded the Society for Art [Verein für Kunst], which aimed to promote young writers like Thomas and Heinrich Mann, Alfred Döblin, and Gottfried Benn. In 1910, Walden began publishing Der Sturm [The Storm], a journal crucial to the spread of Expressionism in both literature and the visual arts. Walden venture’s benefited from both the financial and moral support of Karl Kraus, the editor of Die Fackel [The Torch] in Vienna. It was Kraus who encouraged Walden to publish Oskar Kokoschka’s illustrated Expressionist drama, Murderer, the Hope of Women [Mörder, Hoffnung der Frauen], in his first issue. Walden eventually went on to found a school, gallery, and theater all under the same name. It was also under the “brand name” Sturm that Walden showcased the newest trends in art: in March 1912, he exhibited work by the Munich-based artists’ group Der Blaue Reiter, and in 1913 he hosted the “Fall Salon” [Herbstsalon or Salon d’Automne], which included works by Delaunay, Léger, Picabia, and Kandinsky. Walden’s growing interest in the visual arts was no doubt influenced by his 1912 marriage to Swedish painter Nell Roslund (1887-1975). After World War I, however, he became more involved with leftist politics, using Der Sturm as a mouthpiece for political views (as a result of which the journal is said to have declined in influence). Walden continued to be active as a publisher, gallery owner, and art dealer until 1931. In 1932, he emigrated to the Soviet Union with his wife and child and began working as a language teacher and editor. In 1941, he was arrested for his modernist proclivities and sent to a labor camp, where he died the same year.